miniT modern square steel and glass outdoor Bioethanol-Fueled fire pit from ecoSMART Fire - The design of the striking Mini T outdoor fireplace is inspired by the 'Padella Romana' – a distinctive lighting feature used at the entrances of wealthy families during the Roman Empire. A stunning addition to any outdoor space, the Mini T features a brushed stainless steel base and a solid plinth, made from four toughened glass panels, which encloses the central, elevated flame. The glass surround not only enhances the drama of the fire, but also ensures safety. This visually attractive fireplace encases a 1.25 gallon stainless steel burner. 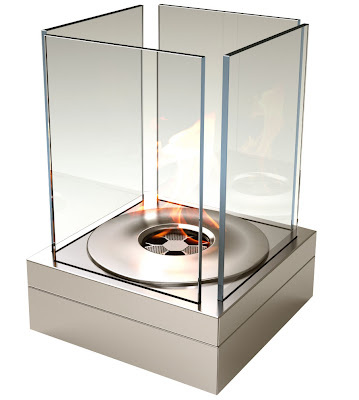 The fireplace can be turned on and off as desired using an accompanying lid. The outdoor Mini T Fireplace is a stylish addition to an alfresco party or event – at any time of the year. 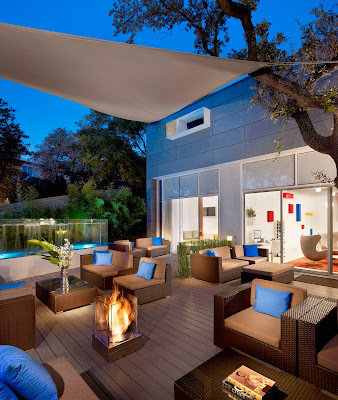 The focus is on bringing the inside out and enjoying alfresco living all year round. EcoSmart's Mini T Fireplace is deal for garden and swimming pool areas, outdoor dining settings and bars and restaurants. It also makes a great patio fireplace. And as with all EcoSmart Fires, this new alfresco model runs on denatured ethanol, a renewable energy. This freestanding EcoSmart Mini T Fireplace has a fireplace insert which uses 1.25 gallon of denatured ethanol which will last you about 7-20 hrs (depending on flame height adjustment.) Replacement denatured ethanol can be purchased at our showroom or at your local hardware store. Denatured ethanol is a solvent composition derived from agricultural products such as sugarcane, potatoes, bananas, beetroot and wheat. 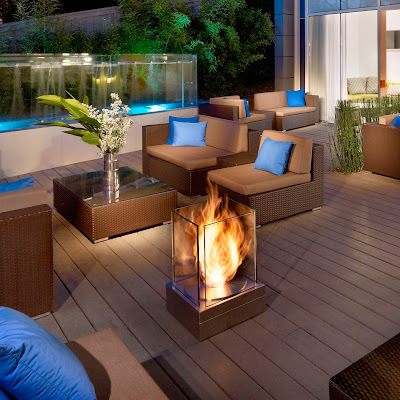 Denatured ethanol ensures a safe and clean burning fire with no smoke at all.